If you’re building the case for getting or increasing a marketing research budget to better understand your customers, or if you're just making the case to better respond to customers’ needs and wants in general, this week’s chart is for you. Read on to see the chart (and grab it for your own presentations), along with analysis and commentary from Jonathan Abelmann, President and Co-Founder, Bestow, and Tom Buiocchi, Executive Director and CEO, ServiceChannel. How much do you feel [company name] understands and responds to your needs and wants? Building a customer theory is the process of conducting marketing research, preferably including behavioral experimentation data, and then using that research to inform a deeper understanding of the customer. That understanding is then, hopefully, used to respond to customers’ needs and wants with customer-first marketing and customer-first business practices. 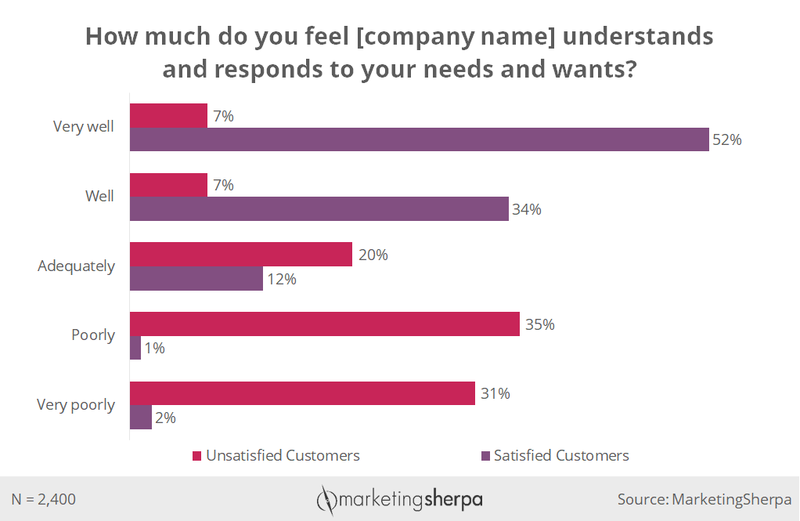 According to our research shared in the chart above, 52% of satisfied customers said the company understands and responds to their needs and wants very well, while only 7% of unsatisfied customers said the same — a 643% difference. And the satisfaction numbers drop sharply from there. “A positive satisfaction ratio is only achieved when a company understands and responds better than expected (well or very well). Thus, even adequate performance leads to a negative net customer satisfaction,” Jonathan Abelmann, President and Co-Founder of Bestow, told me after I showed him the data. So, if understanding customers is so valuable, how can you better understand your customers? Here are a few ideas for engaging in marketing research. They include the traditional ideas as well as an expansive view of marketing research — seeing every customer touchpoint as not only an opportunity to add value for the customer, but also a chance to learn from the customer and build business intelligence. One way to learn from customers is to simply ask them. The easiest way to do that on a mass basis is through a pre-purchase survey to understand what value they might want from your company and how your company can best serve them. This is about product delivery and customer service, but it goes beyond that. It can help you understand what marketing messages they think will most resonate with them, along with what channels they want to hear from you in. After the purchase — both immediately and at a key juncture after purchase where they would have a true understanding of your product (shorter for simple products, longer for complex products) — you can survey customers to understand how well you have delivered on their wants and needs (customer satisfaction). Find out how your company can change its product offering or delivery to improve satisfaction for future customers, and ask what additional products and services these customers might be interested in. With any survey, an incentive (e.g., sweepstakes entry, small Starbucks gift card for each completion, free product or product upgrade, points in your rewards program, etc.) will significantly increase customer participation. There are many ways customers will give you valuable feedback without even asking. For example, natural conversations on social media. Reviews and ratings on sites like Yelp or B2B industry forums can give surprisingly detailed feedback. They can provide significant business intelligence to improve your understanding of customers. As with surveys, not only should you monitor these conversations, but you should also respond to their specific concerns. Remember to show customers how you’re building a better company for them based on their observations and feedback. This becomes a recursive loop in some sense. The more you learn from customers and serve them better, the more you tip customers from being unsatisfied to being satisfied, which creates better reviews and more new customers. “Detractors do more damage than promoters. For example, a handful of four- and five-star reviews for a product on Amazon carries a stronger influence on decision making than many reviews averaging three stars,” Abelmann said. “Omnichannel support is very helpful. Some customers prefer to read, others chat, others talk. Providing flexible interaction options is easy and affordable, and allows organizations an easy avenue to collect valuable data on consumer engagement and preferences,” Abelmann said. In addition, your company can track customer service interactions to look for overarching themes of customer frustration it can respond to beyond these one-to-one customer service interactions — with products that better serve customers to begin with, marketing that makes more appealing and accurate promises, and service that helps customers get better use of those products. Much like these other channels, customer service can be used to learn from customers to create more satisfied customers in the long term. It should be used to create more satisfied customers in the short-term as well by delivering value through these interactions. For example, to help deliver that value, Bestow plans on sharing first names of customer service reps and making sure contact information isn’t difficult to find when it launches its digital life insurance solution. So, when a customer needs a resolution or answer, they’re not primed in frustration before the company gets a chance to interact and help resolve any issues. “Customers appreciate real communication,” Abelmann said. Whether your company is a B2C company with physical stores or a B2B company that engages with customers at tradeshows and conferences, train your front-line employees to think beyond the sale or lead. As with customer service, these in-person interactions are a great way to learn from customers. Just ensure these front-line employees have an easy (and even better, incentivized) system in place to record and share this business intelligence with your marketing team. Much like the previous examples, this service-oriented approach to gathering customer intelligence goes beyond just that goal. It creates a better overall experience for the customer and, along with it, better business performance. “Apple has created a differentiated version of ‘service,’ and it’s fully centered around the customer-first approach. It’s no coincidence that Apple is not only the largest tech company in the world, but it’s also the ninth largest company in the world,” Buiocchi said. All the above examples can help you build hypotheses for a customer theory. Based on certain input and interactions, you can assume customers need X and will do Y when presented with it. However, to really go to the next level, you should test those hypotheses by measuring actual customer behavior. The most accurate way to do this is with behavioral experimentation like A/B or multivariate testing. Create a few scenarios that you think will improve things for customers and then test them to see what actually works best. This is how assumptions become a firm customer theory that can guide your business and marketing decisions. “If brands don’t practice customer-first marketing, they’re dead — period. Customer-first marketing is ONLY effective — or achievable — by engaging with customers,” Buiocchi said. Response without understanding is just a scattershot guess. But understanding without response has no value to the customer. So, once you have a firm understanding, make sure you become an internal advocate for improving the customer experience in the marketing department and throughout the business. “For brands, being customer-first is critical to the trust of your consumers, and more importantly, delivering on the message will ensure their loyalty,” Abelmann said.